"A Fair for Antique Dolls, Teddy Bears and Toys. 200 Years of Childhood. 1750-1950." We look forward to seeing you at Kensington Town Hall on Sunday 18th November 2018 We have many of the top names in the Industry bringing their dolls, teddy bears and toys for you to browse and buy. Entry tickets are £5 which you may buy in advance to guarantee fast track entry, or buy on the door. Early bird and late entry tickets available. The fair will run from 10am to 3.30pm. We've listed details of Hotels nearby, Museums, Concert Halls, Theatres and the magnificent Christmas lights tours for you too. Details below. To book any of these activities, select the "Book a Stand" tab etc. We do hope you can come! We're going out WEST for 2018! Let's follow the Yellow Brick Road to the Rocky Mountains and have a great time! If you haven't attended a DAG International Convention in a while, OR maybe you have never been --- NOW IS THE TIME! You'll enjoy the lectures, the friendly faces and share in the creative side of dolls. We have fun! We are making plans for the Yellow Brick Road costume party -- so much fun! It will be a great convention in a fabulous city with lots to do. NEWCOMERS WELCOME! Please refer to the DAG Convention Invitation for complete information including tentative convention program. Some times have changed so be sure to check it out! (In DOLLS Beautiful 2017-4 winter issue or download from the DAG website. at: 607-432-4977 but email is best. Opening Reception, Admission to a Fabulous Sales Room, Exceptional Competitive and Special Exhibits, a Variety of Programs, and an Enticing Helper Room, Optional Ticketed Meal Events, Workshops and Seminars, Optional Pre- and Post Conference Activities, Closing Banquet and a Limited Edition Souvenir Doll by Dianna Effner. an affiliate of the United Federation of Doll Clubs, Inc. Since its launch in the Summer of 2005, Las Vegas Market has become the most comprehensive furniture, home décor and gift market in the Western United States! With 4,200+ lines in a world-class destination, Las Vegas Market offers efficient access to furniture, bedding, lighting, flooring, accessories and gift resources as well as signature west coast introductions on an easy-to-shop campus at World Market Center. Join us for an exciting experience with friends and family. Fun filled days of educational activities, world-class salesroom, themed meal events and sightseeing opportunities! The National Antique Doll Dealer Association (NADDA) hosts an annual show/sale in various locations throughout the United States and they are open to the public. NADDA dealers from around the world come to present their dolls for sale. In conjunction with the show, NADDA hosts an exhibit and an informative program presented by one of the members or a guest doll authority. In addition to the annual NADDA doll shows, you can find NADDA dealers at many doll shows in the country. Look for dealers who display the NADDA logo in their booth and buy with confidence. Click here to learn more about the exciting events at the show! 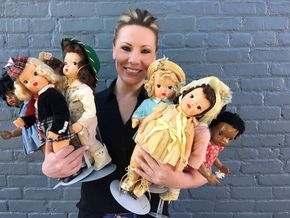 If you are a Terri Lee collector, you will not want to miss the exciting collection of Terri Lee dolls and accessories that are going to be offered at our show. Rachel Hoffman of Turn of the Century Antiques (CO) will be coming straight from the Terri Lee Convention in Evansville, Indiana to Wilmington with the remarkable collection of Terri Lee expert and author, Peggy Casper. This collection will be offered for sale to the public, and it will include rare dolls, outfits, accessories, and some of those 'hard to replace' parts and pieces. Peggy Casper had it ALL! Rachel will be on hand to chat about Peggy Casper's life and legacy in the doll community & will also be filming LIVE via the Ruby Lane 'DOLLY CAM' throughout the show. The Ruby Lane 'Dolly Cam' travels across the country to all of the best doll events and sales, and they will be LIVE throughout the weekend in Wilmington! The videos are streamed in real time on the Ruby Lane Dolls Facebook page and then transferred to YouTube where they live so you can share them with your family and friends. Did we mention that the wonderful Terri Lee & book pictured will be raffled off to one lucky person attending the show? All proceeds from the raffle will be donated to the UFDC Doll Museum! A big thank you to Rachel for this fabulous donation. This UFDC Region 15 event theme is "Little Women" and will be held at the Sheraton Framingham Hotel & Conference Center, located at 1657 Worcester Rd, Framingham, MA 01701. Twice a year, thousands of retailers and designers come to Las Vegas Market to see what’s new, what’s hot, and to get ahead of trends for the coming season. Since its launch in the Summer of 2005, Las Vegas Market has become the most comprehensive furniture, home décor and gift market in the Western United States, presenting a unique cross-section of 3,000+ resources in an unrivaled market destination. In addition to the Instagram #viewonvegas takeover, Rachel Hoffman is also giving a tour of the Discoveries Pavilion which you can RSVP to now! UFDC Region 6 Doll Conference "Western Treasures"
UFDC 67TH National Convention "Kindred Spirits"